The Department of Management Studies, IIT Delhi as a part of Business Leaders Lecture Series coordinated an enlightening session with Mr. Sanjeev Aggarwal, Vice President – After Sales, Nissan and Datsun. The theme for the session was “Importance of Kaizen and PDCA in Logistics”. The session commenced with Mr. Aggarwal highlighting the structure and flow of the presentation. In order to understand the importance of Kaizen and PDCA, it is of utmost importance to differentiate between supply chain and logistics as the two terms are often used interchangeably. Supply chain is a full cycle including sourcing and procurement, manufacturing, product, inventory, distribution, logistics, retail and customer while on the other hand logistics is a part of the supply chain including supply and demand planning, inbound transport and supplier management, inventory management, packaging, order processing, distribution management and outbound transportation. Mr. Aggarwal rightly pointed out the scenario of present world wherein the competition is not between organizations anymore rather between their supply chain and logistics. Moreover, the main reason for failures of any organization is the lack of coordination between the supplier and customer and the presence of non-value added activities in the supply chain. He also mentioned the various key performance indicators of supply chain entailing minimal inventory, optimum costs, and quicker lead-time. The outcome of improving upon these KPIs is to meet the customer demand for faster delivery of products. In order to reach benchmarking level, he specified the use of bottom up approach. The main tools for this approach include Kaizen and PDCA (Plan, Do, Check, Act). Kaizen is basic rule for excellence whereas PDCA is control for continual improvement. The deployments of these tools are done by engaging workers, skill upgradation, continuous training, benchmarking, supplier visits and supplier training. Giving an example of Nissan, Mr. Aggarwal explained how engaging the workers by guaranteeing them an open ear to their ideas in order to make their life easier has by far been the most fruitful deployment of the above-mentioned approaches. 143 ideas were received in a month out of which 31 were implemented. Nissan has implemented 145 ideas until now. These ideas majorly focused on safety, quality, cost saving and productivity. In case of Nissan, Kaizen and PDCA approach has shown improvements in terms of reduction of lead-time from five days to same day delivery in certain cities. Optimum Costs have been reduced from 24% to 12.5% even after the business for Nissan has doubled over the years. Global benchmark for Optimum Costs is 8% and in order to achieve this aim, consistent cost reductions are required. Key actions of Nissan for achieving the same include schedule pickup, full truckload in transport, specification optimization and flexibility in packaging and space reduction in warehouse. Nissan has successfully reduced space in warehouses to the extent of sub-leasing the extra space and earning from the same. Meeting their benchmark levels has been a huge success for Nissan and they have further set higher goals for themselves. Another important factor of success for them is daily morning meets that has helped in handling certain issues on priority basis. This is called Daily Work Management (DWM). Certain revolutions that have come about include reduction and maintenance of fill rate for which Nissan is at second position in India. Gradually logistics is becoming the front face of a company, which is accompanied with new challenges like warehouse on wheels, multi depot, reaching customers as quickly as possible, grooming the last mile associates, almost zero inventories, zero tolerance of customers, customer lounge with smart facilities and so on. In order to deal with such requirements, Kaizen, PDCA and DWM help in achieving service excellence and customer satisfaction. With this, floor was opened for questions and our guest, with his profound expertise and competence, answered all the queries of the students. 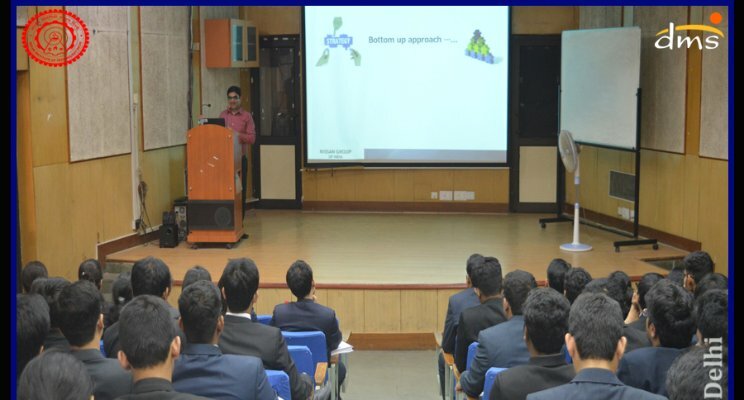 DMS, IIT Delhi expresses its heartfelt gratitude to Mr. Sanjeev Aggarwal, for sparing his valuable time and delivering such an informative lecture to our students. We look forward to having him on campus again.